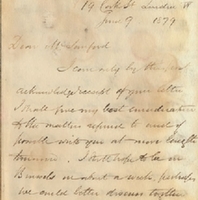 A letter from Sir William MacKinnon (1823-1893) to Henry Shelton Sanford (1823-1891) dated June 9, 1879. The letter indicated MacKinnon's upcoming travel plans and his interest in speaking with Sanford in greater detail about an unspecified matter. He also provided an update on the acquisition and transportation of four elephants to East Africa. The elephants were meant to aid a Belgian team tasked with exploring East Africa on behalf of King Leopold II of Belgium. The elephants were bought by the Belgian king and shipped from British India. In the letter, MacKinnon noted that he had received a telegram "from Aden" informing him of the safe arrival and landing of the elephants. Aden is a seaport in present-day Yemen. At the time, it was controlled by Britain and administered as part of British India. It was of roughly equal distance between Mumbai, Zanzibar, and the Suez Canal, all of which were important destinations of British shipping routes. MacKinnon added in the letter that he had not heard whether the elephants had subsequently landed safely in Zanzibar, although the carrier had since returned to Aden from its voyage. MacKinnon noted that his "part of the work connected with this experiment is now completed successfully," adding his support for the future success of the expedition. Sir William MacKinnon was a Scottish ship-owner and businessman who established significant trade networks and commercial interests in British India and later in East Africa. Among other business ventures, he founded the British India Steam Navigation Company and the short-lived Imperial British East Africa Company. During his lifetime, he was one of the leading ship-owners in the British Empire. By the 1880s, he controlled more shipping tonnage than any other individual in Britain. MacKinnon met Henry Shelton Sanford sometime in the late 1870s and the two began corresponding regularly in 1879. MacKinnon's interest in Sanford stemmed from the former American ambassador's close proximity to King Leopold II (1835-1909) of Belgium and the Brussels inner-circle of businessmen, politicians, and diplomats. Sanford, living in a château in Brussels, provided a valuable lifeline for MacKinnon, who sought Belgian business connections to support his expanding commercial ventures, particularly in East Africa. He was a vital factor in the formation of the Florida Land and Colonization Company (FLCC), going so far as to lend Sanford £8,000 in early January 1880. He also played an essential role in helping Sanford court early participants in the investment plan. Many of the board members of the FLCC, like Edwyn Sandys Dawes (1838-1903), were close associates of MacKinnon. With his business ventures strongly tied to British and Belgian development schemes in Africa, MacKinnon had no ostensible interest in Florida land investment. His participation in Sanford's Florida ambitions was thus directly linked to his interest in maintaining strong relations with Sanford and his valuable connections in Belgium. Original letter from William MacKinnon to Henry Shelton Sanford, June 9, 1879: box 127, folder 2, subfolder 127.2.6, Henry Shelton Sanford Papers, General Henry S. Sanford Memorial Library, Sanford Museum, Sanford, Florida. Digital reproduction of original letter from William MacKinnon to Henry Shelton Sanford, June 9, 1879. Box 127, folder 2, Henry Shelton Sanford Papers, General Henry S. Sanford Memorial Library, Sanford Museum, Sanford, Florida. Originally created by William MacKinnon. Donated to the Connecticut Historical Society after 1901. Loaned to the Tennessee State Library and Archives for processing until June 1, 1960. Acquired by the General Henry S. Sanford Memorial Library, Sanford Museum in 1960. The displayed collection item is housed at the General Henry S. Sanford Memorial Library, Sanford Museum in Sanford, Florida. Rights to this item belong to the said institution, and therefore inquiries about the item should be directed there. RICHES of Central Florida has obtained permission from the Sanford Museum to display this item for educational purposes only. Fry, Joseph A. Henry S. Sanford: Diplomacy and Business in Nineteenth-Century America. Reno, NV: University of Nevada Press, 1982. Hochschild, Adam. King Leopold’s Ghost: A Story of Greed, Terror, and Heroism in Colonial Africa. Boston: Houghton Mifflin, 1998. Munro, J. Forbes. Maritime Enterprise and Empire: Sir William MacKinnon and His Business Network, 1823-1893. Rochester, NY: Boydell Press, 2003. Munro, J. Forbes. “"Shipping Subsidies and Railway Guarantees" The Journal of African History 28, no. 2 (1987): 209-230. Boulger, Demetrius Charles. The Congo State or, the Growth of Civilization in Central Africa. London: Thacker, 1898. MacKinnon, William. “Letter from William MacKinnon to Henry Shelton Sanford (June 9, 1879).” RICHES of Central Florida accessed April 23, 2019, https://richesmi.cah.ucf.edu/omeka/items/show/4041.